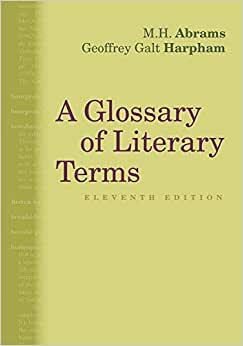 First published over fifty years ago, A GLOSSARY OF LITERARY TERMS remains an essential resource for all serious students of literature. Now fully updated to reflect the latest scholarship on recent and rapidly evolving critical theories, the new contains a complete glossary of essential literary terms presented as a series of engaging, beautifully crafted, essays that explore the terms, place them in context, and suggest related entries and additional reading. This indispensable, authoritative, and highly affordable reference covers terms useful in discussing literature and literary history, theory, and criticism. Perfect as a core text for introductory literary theory or as a supplement to any literature course, this classic work is an invaluable reference that you can use throughout your academic and professional careers. "The fact that you can look up a term like 'ballad' and find out the history of ballads in English very concisely and then get suggestions of key works to read to expand your knowledge is what makes this book exceptional." "This book is absolutely unique because of the lucid essays found throughout - essays which are ambitiously comprehensive, yet succinct. I've been looking at handbooks of literary terms for several decades but have yet to find an equal to the Glossary." M. H. Abrams is a distinguished scholar who has written prize-winning books on eighteenth- and nineteenth-century literature, literary criticism, and European Romanticism. He also is General Editor for THE NORTON ANTHOLOGY OF ENGLISH LITERATURE. In addition, M. H. Abrams has been the recipient of Guggenheim, Ford Foundation, and Rockefeller Postwar fellowships and the Award for Literature by the American Academy of Arts and Letters (1990). This is a good resource book, particularly for those taking English Lit. courses in college. I used the section on “comedy” to write a paper on Shalom Auslander’s use of farce in his book entitled Beware of God. However, I could think of quite a few research projects and papers that this would help out exceedingly with. Indeed, this volume is jam-packed full of helpful terminology, classifications, and definitions. The only drawback I have found is that not all terms I have been inundated by in literature classes are included in this text. I remember looking more than a few words up and not finding any listing for them. A few examples are “metaliterature,” “plurivocality,” and “authorial reticence.” Nevertheless, most terminology an undergraduate should need to know (and then some) is included in this book. If I could, I would give this book a 4.5 out of 5, but such a rating is impossible. I say this because the explanations provided for those concepts Abrams does cover are in depth and thoroughgoing. However, since the book is slightly less than perfect, I will give it a 4 out of 5. I am enjoying this handbook not only as a reference, but also as a good read to review and enhance of my love and understanding of literature. I have an old beat up literary terms handbook that I have used for years, and I decided to order a new one to update my information. I was pleased that this was not just a brief definition with examples, but a discussion to place the terms not only in examples but in context. I can see how this might provide a greater scope for the new literary student, but for an old high school English teacher, who knows many of the terms and desires some complexity in the examples and discussions. I have it by my bedside so I can pick and choose a literary genre or term to explore. 5.0 颗星，最多 5 颗星A very handy book. A very nice and informative book to have. I guess it is a little expensive in the newest version, but I am going to still give it 5 stars as this will go down in price. I don't really see any reason you NEED this version, but it still is a worthwhile purchase for anyone serious about English and the arts that follow from it. Detailed and handy for anyone in college. Recommended.